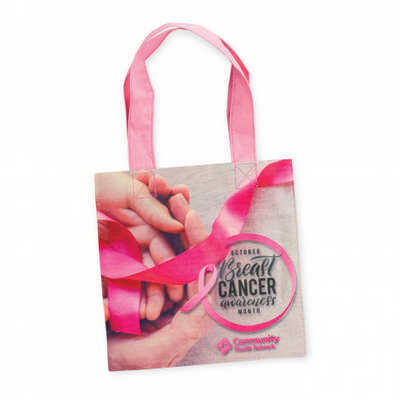 140gsm gift size cotton tote bag which can be branded in full colour on both sides at no extra cost. The handles and stitching are available in 16 colours which will match unless requested otherwise. A production lead time of 15 working days applies to this product by air freight and larger orders can be sea freighted on request to reduce the freight cost. Colours: Handles and Stitching: Natural, Tan, Yellow, Gold, Orange, Pink, Red, Burgundy, Lime, Bright Green, Dark Green, Forest Green, Teal, Royal Blue, Navy, Purple, Black. Dimension: H 225mm x W 216mm (excludes handles). Print Description: Please refer to template. Print Type: Sublimation Print. Packing: Loose packed. Less than minimum quantities are not available for this item.